It's time! The Elite 8 Sports Viz contest is now open for submissions! This is the first of three contests in our Iron Viz series, all leading up to the big finale, a live viz battle at the Tableau Conference in Seattle in September. Contest entries are due on March 21st, so find some sports data and get vizzing! 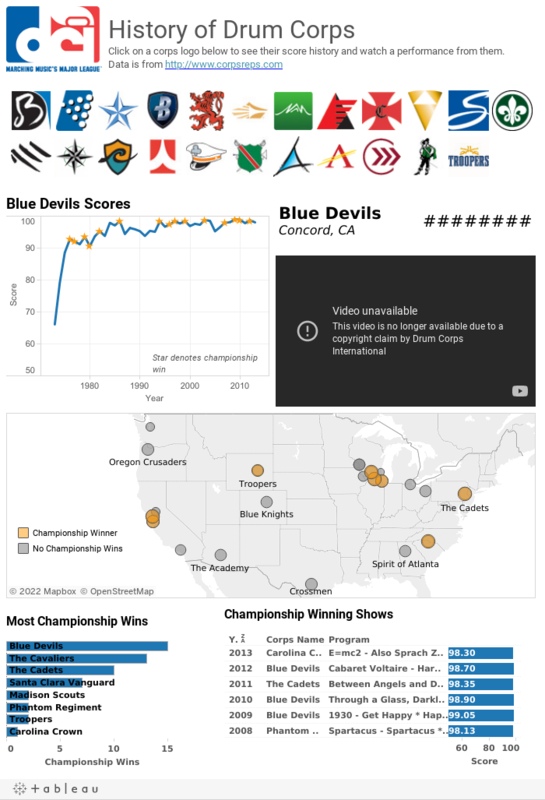 For the Elite 8 contest, you can choose any sports related data you want to create your dashboard. You can submit your viz using this form. Once all the submissions are in, a panel of Tableau employees with discerning taste will narrow down the pool to the top 8 submissions. On March 24th, we'll announce the Elite 8 and you can take to Twitter to make sure that your favorite comes out on top. To help get you inspired, and to prove that I'm going to have a *ahem* wide definition of sports, here's a viz I created about my favorite competitive sport: marching band. It truly is "March" madness! Click on the image below to view the viz. For more details about the contest, check out the submission page. If you have any questions about the contest, email me at jloree@tableausoftware.com or tweet me, @jeweloree. Good luck and get vizzing!